On February 10, Israel reported that one of its helicopters downed an Iranian drone launched from Syrian territory, and that the Israeli Air Force (IAF) had hit several military targets in Syria, prompting retaliatory fire from Syrian air defense systems. On Saturday, the Israeli Defense Force claimed that an Apache attack helicopter intercepted an Iranian drone infiltrating the disputed area of Golan Heights, which has been at the center of conflict between Syria and Israel. The alleged footage of the attack, what the Israeli military said, was a strike against Iranian targets in Syria, was tweeted by the IDF’s spokesman, Jonathan Conricus. — Jonathan Conricus (@LTCJonathan) 10 февраля 2018 г. The Israeli aircraft was said to have crossed into Syrian territory to destroy the command post that was used to control the alleged Iranian drone. Following the incident, Syrian state-run agency SANA reported that the country’s air defense systems had opened fire on Israel. Israeli media outlet Haaretz reported later, citing sources that Israeli missiles had targeted a "research center," located north of Damascus. — IDF (@IDFSpokesperson) 10 февраля 2018 г.
Syria’s air defenses managed to hit several aircrafts and triggered air raid sirens. 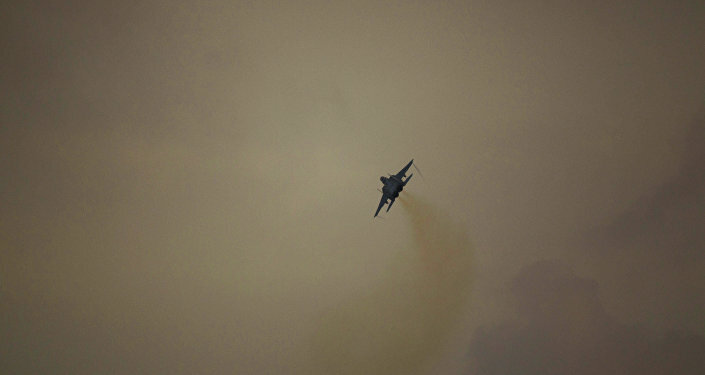 An F-16 fighter jet came down in northern Israel, with its two pilots managing to bail out of the plane. One of the pilots was severely injured, while the second received only slight injuries, according to The Times of Israel. The circumstances surrounding the incident remain rather vague and offer multiple versions of the crash; an initial Israeli Air Force investigation has suggested that it was prompted by an explosion of an anti-aircraft missile next to the plane, but not necessarily from a direct hit. If the plane was in fact brought down by Syria, it would mark the first such incident since the 1982 Lebanon War. Israel launched a second wave of reprisal attacks against “additional Iranian targets in Syria” and the Syrian aerial defense array. The IDF said eight Israeli fighter jets had hit twelve targets in Syria, including three air-defense squadrons and four Iranian military objects deployed in the country. The IDF will act determinately against such severe violations of Israeli sovereignty by Iran and Syria and will continue to act as necessary. The IDF is ready for various scenarios and will continue to act according to situation assessments. Conricus stressed that Israel was not interested in escalating tensions in, claiming that the airstrikes on its territory were defensive in nature. "Syrians and Iranians, from our point of view, are playing with fire. Syrians — when they allow the Iranians to attack Israel from their territory. We are full of determination, ready and able to make everyone who tries to attack us pay a high price." Israel’s Prime Minister Benjamin Netanyahu said that his country would do “whatever is necessary” to defend itself against aggression, stressing that he held Iran and “its Syrian hosts” responsible for the latest developments. — PM of Israel (@IsraeliPM) 10 февраля 2018 г. 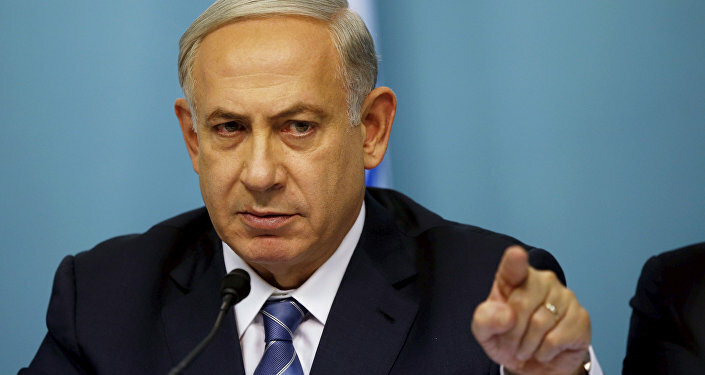 This morning Iran brazenly violated Israel’s sovereignty. They dispatched an Iranian drone from Syrian territory into Israel. And this demonstrates that our warnings were 100% correct. Israel holds Iran and its Syrian hosts responsible for today’s aggression. We will continue to do whatever is necessary to protect our sovereignty and our security. While the Israeli military has claimed that the unmanned aerial vehicle they had intercepted was Iranian, Tehran has firmly denied the allegations. "Reports of downing an Iranian drone flying over Israel and also Iran's involvement in attacking an Israeli jet are so ridiculous… Iran only provides military advice to Syria," TV quoted Iran's Foreign Ministry spokesman Bahram Qasemi as saying. "Moscow is deeply concerned with the latest developments and attacks on Syria. The danger of the escalation of tensions within and around the de-escalation zones, which have become an important factor in reducing violence in Syria, is of particular concern," the Foreign Ministry stated on its website. "Israel is our [US] closest security partner in the region and we [ the US] fully support Israel's inherent right to defend itself against threats to its territory and its people," Pentagon spokesman Adrian Rankine-Galloway said. Russian President Vladimir Putin and Israeli Prime Minister Benjamin Netanyahu held a phone conversation to discuss the latest developments around "the actions of the Israeli Air Force, which delivered missile strikes of targets in Syria," the Kremlin press service stated. "The Russian side spoke out in favor of avoiding any steps that could lead to a new round of dangerous confrontation in the region," it added. Netanyahu, for his part, said that Israel had the right to self-defense, and stressed that Moscow and Tel Aviv agreed "coordination between our armies would continue." "Israel wants peace but we will continue to defend ourselves with determination against any attack on us and against any attempt by Iran to entrench itself militarily in Syria or anywhere else," he said. The US State Department spokeswoman Heather Nauert said that the United States considered the incident on the Israeli-Syrian border Iran's "calculated escalation." "The United States is deeply concerned about today's escalation of violence over Israel's border and strongly supports Israel's sovereign right to defend itself. Iran's calculated escalation of threat and its ambition to project its power and dominance, places all the people of the‎ region — from Yemen to Lebanon — at risk.‎ The U.S. continues to push back on the totality of Iran's malign activities in the region and calls for an end to Iranian behavior that threatens peace and stability," Nauert said in a statement. The Russian Foreign Ministry also noted the necessity of keeping the process of de-escalation in Syria going, and not to exacerbate the situation in the Middle East. "We urge all the involved parties to exercise restraint and avoid any steps that could lead to the aggravation of the situation. We consider it necessary to unconditionally respect the sovereignty and territorial integrity of Syria and other countries of the region." The Pentagon, for its part, added that the US Department of Defense “did not participate in this military operation,” and expressed its concerns over Iran’s “destabilizing activities” in the region. "We share the concerns of many throughout the region that Iran's destabilizing activities threaten international peace and security, and we seek greater international resolve in countering Iran's malign activities," Rankine-Galloway stressed. Israel and Syria, which have never signed a peace treaty, and have a long history of tough disagreements over the Golan Heights, have repeatedly exchanged fire, with the latest incident taking place in early January, when the Syrian government’s army thwarted three Israeli missile attacks on Damascus province. In response, Damascus accused Tel Aviv of cooperating with terrorist groups, claiming that Israel “posed a threat to global security and peace on par with Daesh (ISIS) and Jabhat Fatah al-Sham (formerly known as Jabhat al-Nusra). "The Syrian government once again warns Israel about the dangerous consequences of its attacks against the [Syrian] republic, and once again demands that the UNSC condemn these blatant attacks and take decisive and immediate action to stop these attacks and bring Israel to justice," the ministry declared. The Syrian Foreign Ministry also penned a letter to UN Secretary General Antonio Guterres and another to the UN Security Council. "Israeli attacks are a continuation of an aggressive and dangerous approach by Israel aimed at supporting terrorist groups, which helps the latter to prolong the crisis in Syria and raises their morale, which sunk due to the gains made by the Syrian army and its allies," the letters said.